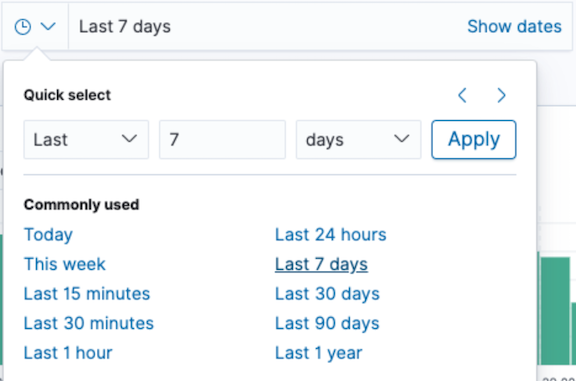 Using the Discover application, you can enter an Elasticsearch query to search your data and filter the results. The current index pattern appears below the filter bar, in this case shakes*. You might need to click New in the menu bar to refresh the data. Click the caret to the right of the current index pattern, and select ba*. The search returns all account numbers between zero and 99 with balances in excess of 47,500. It returns results for account numbers 8, 32, 78, 85, and 97. By default, all fields are shown for each matching document. To choose which fields to display, hover the pointer over the the list of Available Fields and then click add next to each field you want include as a column in the table. For example, if you add the account_number field, the display changes to a list of five account numbers.